Avoiding Bankruptcy: When Do You Borrow from Relatives? Avoiding bankruptcy is a topic I regularly visit with clients. None of my clients want to file bankruptcy if there’s some other viable alternative. And I agree with that approach: explore non-bankruptcy alternatives first, then explore bankruptcy options. One way to avoid bankruptcy is to get help from relatives. And it’s sometimes an option worth considering. When Is It Right to Ask Relatives for Money? The answer to this question, as with so many other bankruptcy questions is, “it depends.” I’ve had this come up twice in the last month here in my Summerville bankruptcy practice. In one of the cases, I not only thought it was right for the client to ask her relatives for money, I actually encouraged her to do so. And in another case, I thought it wasn’t such a good idea. Betty–not her real name, of course–was an older lady I had the pleasure of meeting here in Summerville. She was a month or two behind on her house payments, which are modest, and also a couple months behind on her car payments. She had very little other debt; in fact, I don’t believe she had any credit card debt. The obvious bankruptcy method for “fixing” her financial problems is a Stop Foreclosure With Chapter 13. That would allow her time to cure the arrearages–to “catch up”–on those mortgage and car payments. But her income was very small, and a Chapter 13 would mean being in bankruptcy for three years. (She was under median income, so she’d only be required to pay for three years, not five.) Chapter 13 would also have cost her attorneys’ fees and filing fees. All this to fix a few missed payments seemed like overkill to me. In fact, we figured that she’d only need about $3,000 to make up the missed payments. Filing a Chapter 13 bankruptcy for her would be like using a sledge hammer to drive a finishing nail. Once I realized Chapter 13 was too cumbersome a solution for Betty, I began searching for other alternatives. I asked Betty if she had any children. She did. They were adults with jobs and a possible source of help for Betty. She didn’t want to ask them for money, but, as I advised her, she’d only need $1500 from each child. And from a moral standpoint, I didn’t see any problem with Betty going to children she’d fed, clothed, and put through school to ask for a little help. It was a small amount of money, and her children had a moral obligation to come to mom’s rescue, especially given the fact that mom needed so little. Result: Bankruptcy avoided. I didn’t collect a fee, but I think I did the right thing by helping out a nice lady who just needed to be pointed in the right direction. Betty also knows that Chapter 13 bankruptcy is there if she needs it. In the second situation, I got a call from a young couple with no children. Household income was around $75,000. The couple had amassed significant credit card debt and had an expensive vehicle payment. The bankruptcy option in this case–like Case #1 but for different reasons–was to file a Chapter 13 bankruptcy. Median income for a household of two in South Carolina is about $50,000; this couple had about $25,000 more than that in annual income. Qualifying for a Chapter 7 would not have been an option. However, prior to even exploring bankruptcy options–we’d only spoken on the phone–this couple called to say they’d spoken to relatives who would help them out. As a result, this couple decided not to meet with me for a consultation. For their situation, we should have seriously considered bankruptcy. The money needed to “fix” their situation was substantial, and placing that burden on relatives has all sorts of negative consequences. First, would the couple really learn anything from their financial mismanagement if their parents bailed them out? Second, how would this affect their relationship with their parents if they could not make the payments? Third, they had to involve parents (both sets, I believe) in their personal financial problems. As entrepreneur and author, Azriela Jaffe, points out: “There’s no such thing as a family loan without emotional ties. If you don’t understand that from the beginning, it will take you by surprise.” And the list of problems goes on. What troubled me perhaps the most about this situation is that the couple didn’t even explore other alternatives like bankruptcy. They indicated that they’d gotten “advice” from their parents. But they really didn’t evaluate all their options. Here, my impression was that they could tap wealthy parents to get them out of this jam and that it was not going to be good for them or their parents. 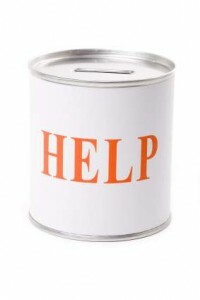 The bottom line is that the decision to ask relatives for help is a difficult one. It depends on the facts. The most important thing to remember of this: Know all your options before making a decision. PreviousPrevious post:Bankruptcy Experiences #4NextNext post:South Carolina Bankruptcy Median Income Figures DOWN! Bankruptcy or a Reverse Mortgage? Suze Orman’s Horrible Advice: Hey, Girlfriend!